As touchscreen displays in the car grow larger, drivers expect screens to operate with the same touch experience as mobile phones. However, screens in automobiles need to meet stringent head impact and vibration tests, and so need to have thicker cover lenses that potentially impact the touch interface performance. As screens get larger, they are also more likely to interfere with other frequencies such as AM radio and car access systems. All of these factors become a major challenge in the design of modern automotive capacitive touch systems. A new family of single-chip maXTouch® touchscreen controllers from Microchip Technology is designed to address these issues for screens up to 20 inches in size. The MXT2912TD-A, with nearly 3,000 touch sensing nodes, and MXT2113TD-A, supporting more than 2,000 nodes, bring consumers the touchscreen user experience they expect in vehicles. These new devices build upon Microchip’s maXTouch touchscreen technology that is widely adopted by manufacturers worldwide. 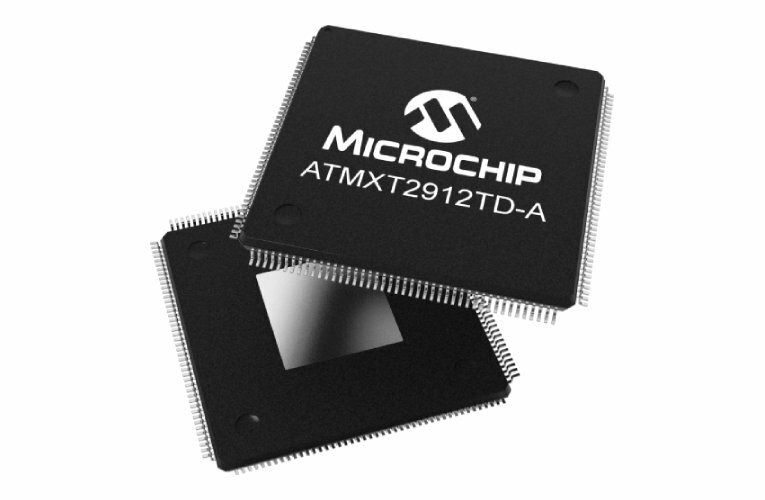 Microchip’s latest solutions offer superior signal-to-noise capability to address the requirements of thick lenses, even supporting multiple finger touches through thick gloves and in the presence of moisture.